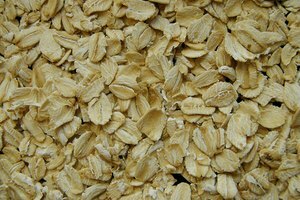 Dehydrating foods is beneficial for camping and hiking, allowing for more compact food without the worry of spoiling. A warm bowl of soup will certainly hit the spot at the end of long day of hiking or camping in the wilderness. 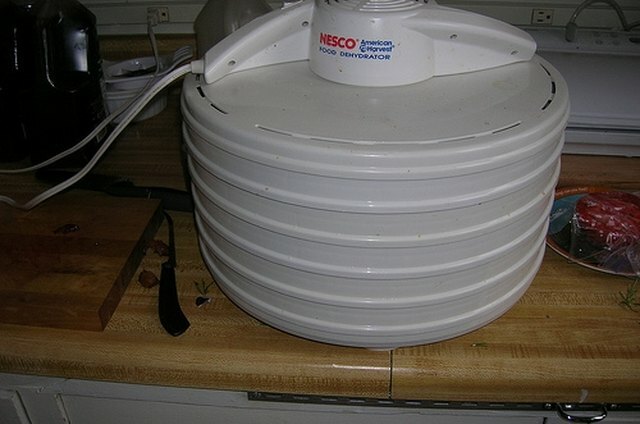 With a food dehydrator from your local kitchen goods store, you can easily make your own dehydrated soup. Prepare your soup. If you are using a canned soup, open the can. 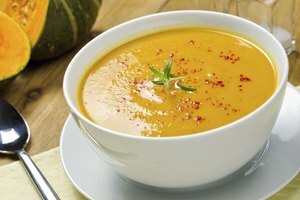 If you are making soup from scratch, prepare and cook your soup as normal, with the exception of the amount of water used. A puree consistency is preferred to an overly watery consistency. Using solid tray liners or plastic wrap, drop the soup onto the tray in small circles no more than 3 inches in diameter. Keep the droplets thin, no thicker than 1/4 inch. Load the trays into the dehydrator and set the temperature for 145 degrees Fahrenheit; leave them until dry. Drying time will depend on many factors, including the consistency of the soup and thickness of the soup loaded into the trays. 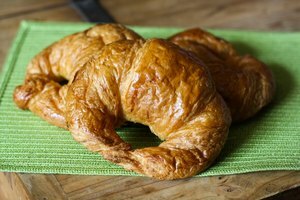 Once dry, carefully remove the dehydrated soup and place immediately into an air-tight glass container or a vacuum-sealed plastic bag. When ready to eat, place soup in a bowl and add boiling water to rehydrate. Heat the soup, and add more water as needed until satisfied with the consistency. If you do not have solid tray liners, try lining the standard meshed trays with plastic wrap. If the soup droplets are thicker than 1/4 inch it will take significantly longer to dehydrate. Load the soup into the trays away from the base of the dehydrator and carefully place the trays in once the soup has been dropped on. It is best to consume dehydrated soup within a few weeks of the dehydration process. Avoid cream-based soups.